Years ago, the word “collagen” conjured up images of absurdly plump lips courtesy of a Hollywood plastic surgeon. But times have changed. Today, collagen isn’t only a sought-after topical ingredient in luxurious skin serums, but a nourishing daily supplement and beauty secret for supporting healthy hair, skin, and nails. In fact, studies show collagen may yield even greater health benefits like aiding in joint health, digestion, and sleep. Wondering what the collagen buzz is all about? Here’s a closer look at this trending supplement. It’s always a good idea to research—and ask your doctor—about a supplement before adding it to your daily routine. Here’s what you need to know about collagen. Collagen is a long-chain amino acid and the primary structural protein found in skin, hair, nails, bones, and connective tissue. Our body contains a whopping 16 different types of collagen (the most popular being type-I, stored in muscles, bones, the digestive tract, and tendons). Collagen naturally declines as we age, which is why it’s good to start supplementing this healthy nutrient into your diet. Collagen is naturally produced in the bodies of animals (particularly mammals) and is typically obtained through cooking procedures, which produces gelatin. Bovine collagen (produced in cows) is the most commonly used in supplements while marine collagen is extracted from cold water fish like salmon and is typically used in skincare products since it’s easily absorbed. Collagen is available in many forms, including powders, capsules, and gelatin. Collagen supports joint health, skin elasticity, strengthens hair and nails, and helps coat the digestive tract. Studies also indicate that collagen’s most abundant amino acid, glycine, may affect neurotransmitters to possibly help improve sleep quality. Collagen peptides, or type-I hydrolyzed collagen, are amino acid chains extracted from animal hides, bones, or fish scales that are then broken into smaller units, enabling them to easily dissolve into liquids. How can I eat collagen? A source of protein, collagen can be a nourishing addition to smoothies, coffee, soups, or broths. It can also be mixed into baked goods, marshmallows, or taken as a pill supplement. Plant-based collagen, comprised of nutrients that support collagen production, is steadily gaining popularity—especially with those following a vegetarian, vegan, or plant-based diet. Unlike traditional mammal or fish collagen, plant-based collagen consists of adaptogenic herbs and vitamins that support natural collagen production in the body. Ingredients found in plant-based collagen powder might include herbs like gynostemma, horsetail, or he shou wu extract, and foods that are high in vitamin C, which is necessary for collagen production. Experience the benefits of collagen when you stock up on these go-to supplements! 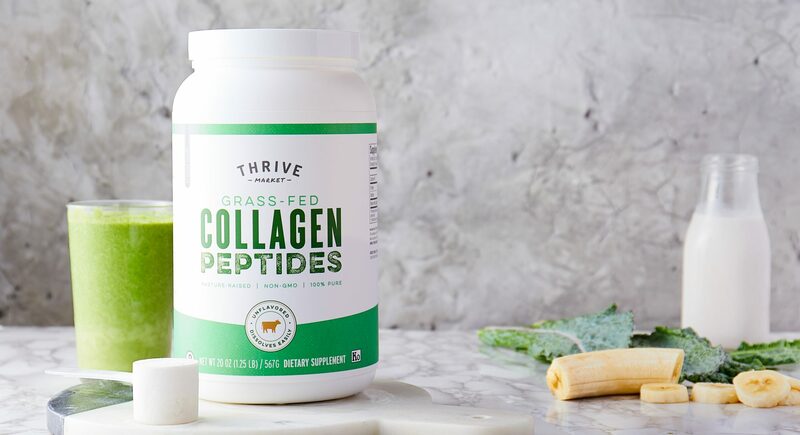 Crafted from the hides of non-GMO, grass-fed, pasture-raised bovines, our collagen peptides deliver 10g of protein in each serving while helping to support healthy hair, skin, and nails. This premium formula features bioactive concentrations of two amino acids that mimic natural collagen found in the body and can be easily absorbed. Add to juice, tea, or water, this plant-based collagen powder works to support natural collagen production in the body. Craving a collagen boost? Beef up your next dish with grass-fed gelatin collagen that’s created under strict sanitary policies and is certified kosher. 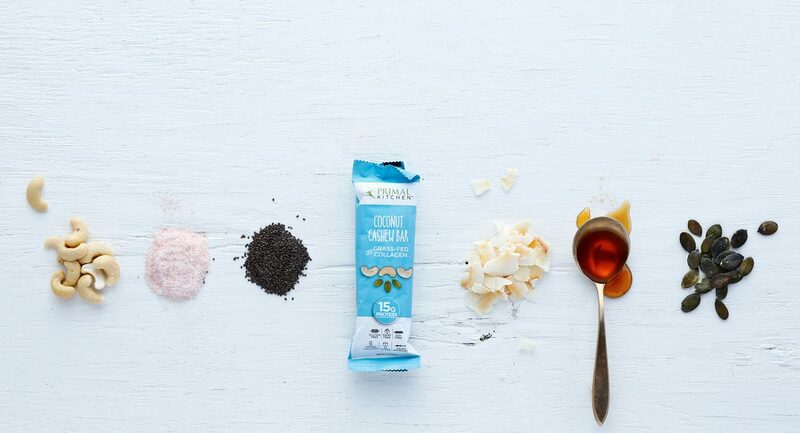 Perfect for chocolate lovers, these sweet treats contain 15g of protein in every bar thanks to grass-fed collagen. The bars get their incredible flavor from organic fair trade cocoa powder, cashews, macadamias, hazelnuts, and coconut flakes. Sip your way to beautiful skin with this genius brew that blends white tea with botanicals and collagen peptides. Cooking with collagen is a great way to add protein, texture, and nutrients to your next dish. Here are some recipes to get you started. You butter believe this recipe is worth giving a try. A combo of ghee, cinnamon, and collagen peptides, it’s the perfect Paleo-friendly addition to your next latte. Something wholesome you can whip up in less than 10 minutes? Yes, please! Just throw collagen peptides, almond and coconut flour, egg, banana, and a few other key ingredients into a mug and microwave your way to a healthy breakfast. No need to feel guilty about spooning this cookie dough! This smart recipe uses garbanzo beans, maple syrup, and collagen powder for a protein boost. If you need a caffeine fix, try these java-laced gummies! Each square serves up MCT Oil (believed to help support a healthy metabolism), steamy coffee, sweet honey, and grass-fed gelatin for just the right amount of wiggle. Drink in healthy hair, nails, and skin with these beautifying beverages. This antioxidant tonic, made with pomegranate collagen liquid, pomegranate juice, orange juice, and sparkling water, also helps support better sleep and digestion. Oh hi, chai! This frothy latte will tickle the senses with cinnamon sticks, ground cardamom, black peppercorns, nutmeg, coconut milk, and raw honey while secretly giving your skin a boost with collagen powder. Like its fictitious namesake, this drink may seem too good to be true, but thankfully it’s very real with a magical blend of vanilla coconut collagen fuel, almond milk, bananas, and yogurt drizzled with a berry delicious strawberry sauce. Ward off free radicals with a refreshing fruit-filled smoothie of juicy blueberries, crisp watermelon, coconut water, and collagen. Detoxing activated charcoal ice cubes combine with collagen-enhanced lemonade for a jaw-dropping elixir that’s almost too cool to drink.